From 8,259 viewers in February 2018 to a massive 427,202 viewers in December 2018. A massive 5,000% increase in only 10 months! Pinterest is now the #1 social media platform sending traffic to my blog. My most popular pinterest blog posts are over 70 homeschooling resources, over 100 of the best books for 9 year olds, 26 reasons why trampolining is healthy for you and travelling to New York with the family. I had never really used Pinterest and in fact it was the last social media platform I had joined. I first started using Pinterest in December last year, but other than joining a few group boards I didn’t really focus on it. As you can see the monthly viewers are only at just over 8k, and I had 80 followers. In March I started to spend a bit more time on it and on the 22nd March I started using Tailwind. As you can see not only have the average monthly pinterest viewers increased massively but also the monthly engaged viewers has too. The difference between the two is the people that engage with your post have either read it, or pinned it. So from February I was averaging monthly views of 8,259 and in April it is now 127,059! I currently only have 496 followers on Pinterest also, so this really is possible with a small number of followers. These are my personal results, but Tailwind also publishes the Typical Results of Tailwind for Pinterest Members every year, so you can see exactly what the average growth rate looks like for their members. In December 2018 it jumped even further to a massive average monthly viewers of 427,202 and 10,888 monthly engaged. This is all with thanks to using Tailwind. Tailwind is the smartest way to manage your presence across the visual web (Pinterest & Instagram), and offers a complete suite of marketing tools including Smart Scheduling, Analytics & Monitoring, Content Discovery, Promotion, Education, Tribes, Hashtag Suggestions and more. I couldn’t agree more, this extension has boosted my pinterest traffic by 1,000% in just 2 months. This is key to working with Pinterest, especially if you want to succeed. Tailwind will tell you when is the best time to post, and you can post as much or as little as you want. Everything in green is when a post is scheduled and posted onto Pinterest. As you can see I post roughly 30 different pins each day. These of course are not all mine, I do roughly 50% mine and 50% others. I know a lot of people recommend the 80% 20% rule, but this works for me. I am based in the UK and would hate to miss important traffic from America and beyond. Most of my Pinterest traffic still comes from the UK which is perfect for my blog. Having a tool that allows me to schedule pins on Pinterest has become essential to my Pinterest marketing strategy, growing my followers, and bringing traffic back to my blog – which is what we all strive for. 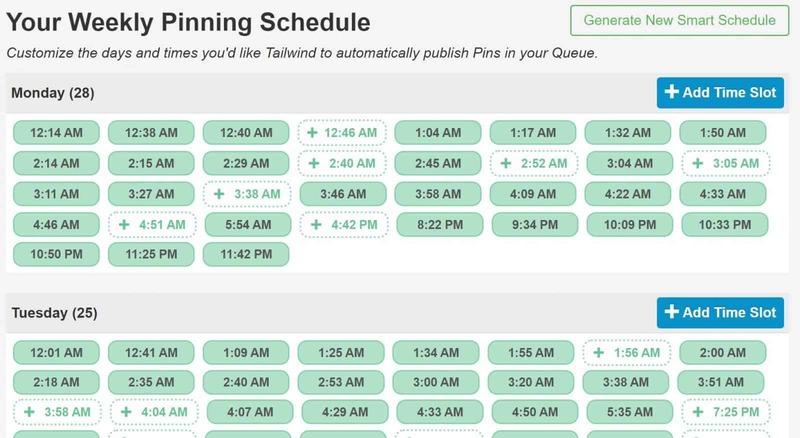 Another great tool that Tailwind offers is the tailwind extension, I use this so much and makes life very easy when scheduling pins. 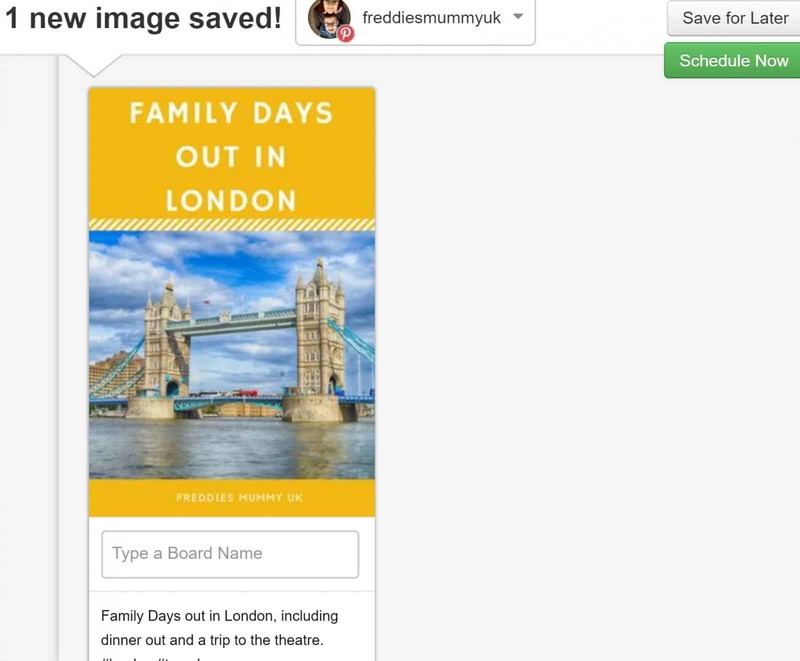 As you can see here in Pinterest I can click on a photo and at the top I can schedule it through Tailwind. Without actually going through to their website. This is a photo taken from a post on my blog and as you can see at the top I can just click on the link and schedule it. This can be done with any image on the web. A new pop-up window appears with the image saved. select which board I want it added to. choose if I want to share it to Facebook or Twitter. click on the little clock and select the month, the day and the time for the pin to be published. Do you have lots of boards that are relevant for your recent blog post? If so I just love this feature. All you need to do is schedule your recent blog to Tailwind and add it to all relevant Pinterest boards. The easiest way to do this is in board lists. I mainly blog about travel and kids and parents so I combine all of these into a board list. This means that when I come to schedule them, I just click on these boards. Tailwind then schedules them into each of these boards at different times. As you can see here, this post why we love taking kids to the theatre I can add it to kids and parents board group. This has 50 different boards that are relevant to this post, so I don’t have to add to them all separately. The Interval Pinning feature of Tailwind App allows you to set a time period between when each image gets pinned, from 10 minutes to 90 days apart. Personally I set it to 24 hours between pins. 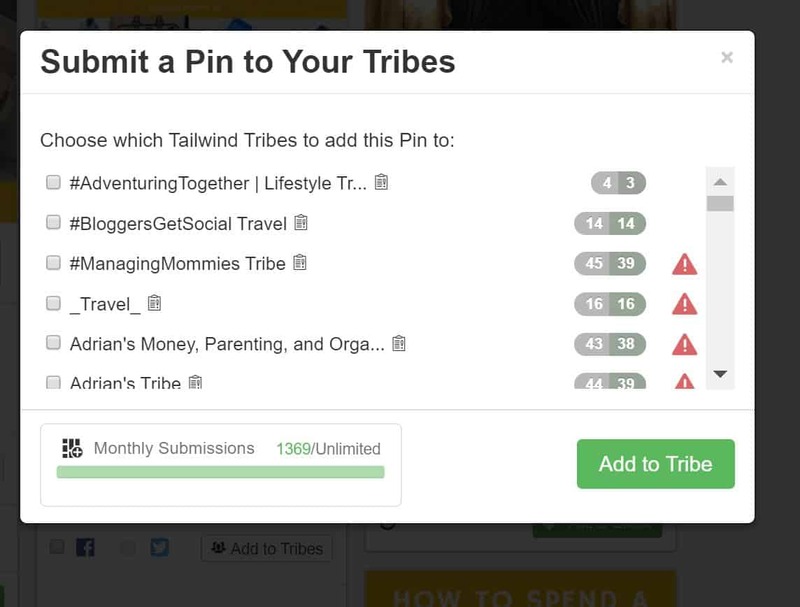 Tailwind tribes has been key in achieving the 1,000% increase in Pinterest traffic. You can search for Tailwind Tribes in your niche and either join or request to join depending on the group manager. I have created a family travel tailwind tribe which you can join and post your vertical family travel pins. The red warning sign shows that I have saved this pin already into this tribe, it also tells me how many days ago I did it. I have a paid unlimited monthly submissions, but you can opt for a free version of this too. Each tribe has its own rules that you must follow to remain in the tribe. Most of them insist on vertical pins (which is key to Pinterest) and most are 1 for 1 pin. So if you post your own pin once you must then pin someone else’s. This is all completed through the scheduler on Tailwind. So they are mixed up with your blog posts. This tailwind tribe as you can see above has 83.7k reshares and 53.5k repins. Others have shared my posts 28 times and I have a potential reach of 2 million from this group alone. If you have a business Pinterest account (which you definitely should) you can find some analytics in here. However, they are no where near as detailed as the Tailwind Analytics. Want to know a particular pin did or how pins are doing on a particular board? Just use the easy search functionality to find whatever it is you’re looking for. 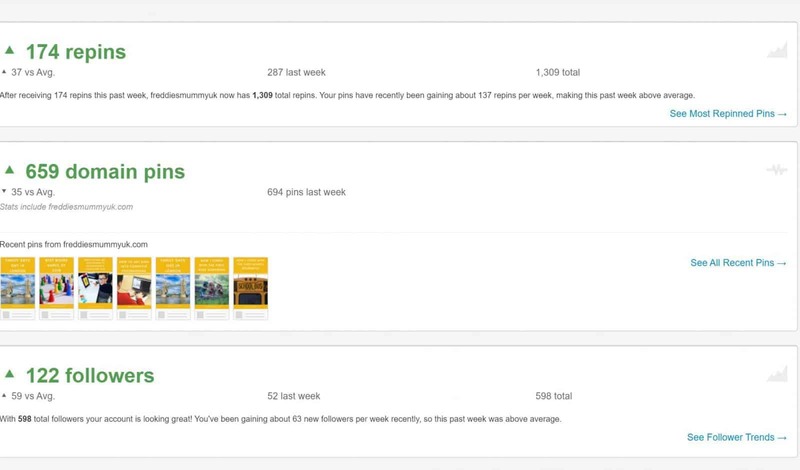 You get a weekly report showing total pins, repins, followers, and most repinned boards that can be broken down into your profile performance. It’s a content quality metric. e.g. if you go from pinning 10x per week to pinning 100x per week you would expect your repins to grow, but, is your content getting better over time? How viral is your content? Are you over pinning or underpinning? A metric in regards to follower growth over time that can give you an idea of how engaged your audience is with the content you are sharing. Click on each tab and column to display the relevant data. See how much activity you are getting from your own blog or website over the last 7 days! What images have actually been pinned from your blog posts. The number of visitors to your blog from Pinterest over last 7 days! You’re just clicks away from repinning your best content. In the Tailwind App dashboard is a tab called Pin Inspector, and this table holds everything you’ve ever pinned on Pinterest. You can search for your pins via a board, category or keyword and see what has performed well over a set time period. Then you can repin your top performing content. Now that you know what’s popular, you can reschedule this content to other relevant boards, or even to the same board. It’s a great way to boost traffic from old posts and expose it to your Pinterest followers who may have missed it the first time. Tailwind offer a free trial. There isn’t a time limit for the 100 pins, either, and no credit card is required. I have the Tailwind plus account which is $15 (approx. £10.75) per month, or if you do what I do and pay a one-time annual payment of $120 (£86) you get 4 months free and your monthly payment comes down to only $9.99 (£7.15) per month. For $9.99 per month you get unlimited Pin Scheduling (400 pins per month on the $15 monthly plan) plus all the amazing other features I’ve just mentioned. Within this you can also access up to 5 Tailwind Tribes and post up to 30 blog posts each month. If you want to power up on your Tailwind Tribes you can pay an additional amount annually. These as the current exchange rate work out as approximately £42 per year for 10 tribes and 80 monthly submissions, £85 per year for unlimited tribe membership with 200 monthly submissions or £257 per year for unlimited tribe and unlimited monthly submissions. Is Tailwind App worth it? I find it very easy to schedule posts to Pinterest, and it saves me no end of time. If I had to manually pin to the boards I would be doing it for hours a day. If you want to be serious about marketing and gaining Pinterest traffic to your blog, this in my opinion is a must. THERE IS CURRENTLY A DEAL THAT IF YOU JOIN TAILWIND WITH A PAID PLAN YOU WILL RECEIVE A $30 CREDIT. If you are interested in increasing your traffic on Twitter, check out my guide to Social Oomph. 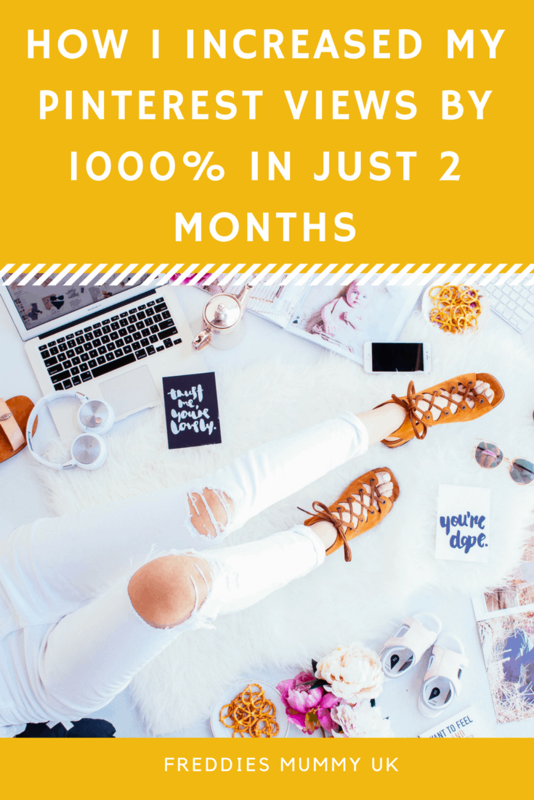 See how I boosted my Pinterest traffic by 1,000% in just 2 months using Tailwind. This includes how to use Tailwind for Pinterest and pricing plans for Tailwind. I have tailwind and was using it regularly last year but have not touched it for months so I should really get back into doing so! 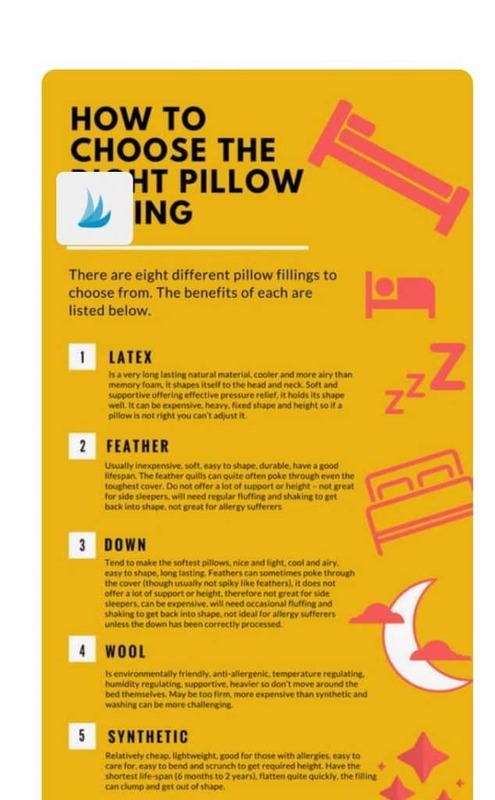 Some fab tips here! Interesting reading, I’m still debating on if I should start paying for tailwind. Slowly leaning towards doing so. I’ve been wondering about a scheduling tool and this does look good … Not sure about paying for something tho’! I tried Tailwind a little while back but noticed absolutely no difference in the amount of traffic I was picking up – I don’t think I’d quite got to grips with it though as I know it really works for lots of people. I like how tailwind is easy to use and the tribes feature. Thanks for sharing your analytics, it helps to see how tailwind actually helps gain traffic. Pinterest is fast becoming my favourite, but I didn’t know about the board lists, we be investigating that on Monday once all the children are back in school.